Well, we don’t have any flowers yet, but we have lichen! While enjoying and photographing some cliff icicles, my day was brightened up by many accents of color on the rocks courtesy of the lichens. These two seem to get along well together; Lemon Lichen (Candelaria councilor), a foliose lichen surrounded by Superficial map lichen (Rhizocarpon superficial), a crust lichen. Hi Montucky, I am impressed that you admire the Lichens – they are important and beautiful, too! Have a fantastic coming week! They are more important than most folks realize. Some are actually a very important food for deer and elk in the winter. Their ages are impressive as well. I’m always surprised by the superficial resemblances between lichens and sea corals. If I didn’t know these were lichens and just glanced, they look for all the world like certain colonies of coral seen in the Caribbean. The same is true with flowers – the anemones blow in the wind, while the sea anemones blow in the currents of the sea. Lichens certainly do provide bright splashes of color the way the corals do. The intricacies of their existence are amazing. Lichens are fascinating because they’re so under-the-radar for most people, but they are quite intricate and the colors are intriguing. Very cool images! I’ve never understood why they are so much under-the-radar. Many are very bright colored. Perhaps because they don’t represent a lot of bulk. Perhaps I’ve become more conscious of them when I found that some species grow only a few centimeters in a century and there are colonies of the Green Map species in the Canadian Arctic that are estimated to be many thousands of years old. I certainly don’t want a misplaced boot to destroy an organism of that age! What amazing colours and forms. It’s surprising how much detail there is if you stop to look. They are very interesting organisms. These are very small, but I see lots of huge patches of the crust lichens too. They are abundant in this area. Love those. Much better than icicles. Sorry, I hate the cold or anything to do with it. These are lovely! They do add much needed color to the winter landscape. The top shot looks like a glass mosaic, done in earth tones. Just lovely. More of Nature’s decorations. Probably some of the oldest art around! Those are excellent shots of lichens. 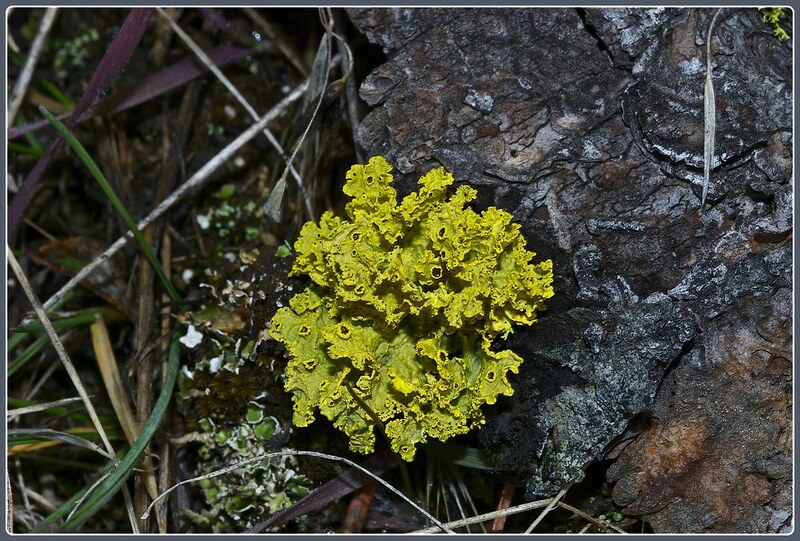 Great minds must think alike-I just wrote two posts about lichens that will appear in the near future. It’s funny how lichens are so easy to overlook (or ignore)until you start really looking for them. Then you find that they are everywhere and you wonder how you could have possibly missed them. I will watch for your posts. I think they get noticed, but then ignored for some reason. They are more noticeable here because they decorate prominent things like cliffs. You know, they might have been the inspiration behind stained glass. You’ve got two lovely images there. The colour and texture of the first is fascinating, I could stare at it for ages, and the depth and clarity of your Powdered Orange lichen is marvellous. Lichens are everywhere and there are thousands of species but they are largely overlooked. It’s a pity, but it’s good to see like-minded bloggers rectifying this state of affairs. I intend to study them more in the future. I know several that are important food for elk especially in winter, and some that I’ve read that make a good and nourishing tea. Montucky: You have accomplished one of the photographs that I want to also take one day of lichen. I find lichen hearty and tough, beautiful in color. Tough they are! I remember seeing many in the Sonoran desert, and they proliferate here in the cold of winter, sometimes thriving in places where nothing else can. Excellent lichen photographs—and with scientific names, too. I’m fascinated by lichens and photograph them when I get a good view, but I’ve never tracked down any of their names; maybe I’ll have to start trying. They could be a very good study! I think I will shoot more of them, since there are so many varieties. In fact, I got a few shots today. I like closeups of things like this. I’m never good at finding lichens. Maybe I’ll have more luck near my new home. You would love wandering around here, Ratty. There are lichens literally everywhere. We have a large rock wall and rock flower bed at our house and we were careful to put the rocks with lichens on them at the top where they wouldn’t be disturbed. They are indeed amazing. They seem to have evolved a species for every type of environment. Perhaps that is why they are among the oldest living plants. Wow these are fantastic! Tundra plants and lichens are fascinating but go un-noticed by most folks. Well done! Perhaps because so many are rather flat and others are quite tiny, they are overlooked. Wow, that is waaaay cool! Such nice variety in color and texture! I’ll have to pay more attention because I haven’t noticed lichen yet. They are easy to find here, but most people just ignore them, or perhaps just take them for granted. They cannot be simply picked and made into bouquets the way flowers can be. I’m not amazed that you thought to take photographs of these lovelies, but impressed with the casual way you toss off their secientific names. Are lichens easier to ID than other plants and animals, or are you just good at it or trained on the subject? No, I’m not trained on them, but I have a pretty good book of plants in this general area and it has great photos and descriptions. There is also a section on lichens in the Burke Museum website. I do the best I can, but I’m certainly not 100% accurate! They do have lots of color. I wish I understood the purpose of that, what kind of survival strategy produces the colors. Awesome, simply awesome. I love lichens and these are stunning beautiful, especially the last photo. Thank You presenting these interesting photos. I have made another visit to that place this past week and brought back more photos of lichens. Their colors are fascinating! Very beautiful photos, I like the first one a lot. Thanks! It’s nice to see the splashes of color on the rocks. Lichens are amazing, aren’t they – and with such spectacular colours. Seen at a distance, they can create natural abstracts. Thanks for these photos, Terry. Yes, they are amazing! Most are very pretty and many are beneficial, yet they are often overlooked and seldom understood. What is really apparent from reading these comments, is that most people barely even notice lichens, but once they become aware of them, they look for lichens wherever they go. 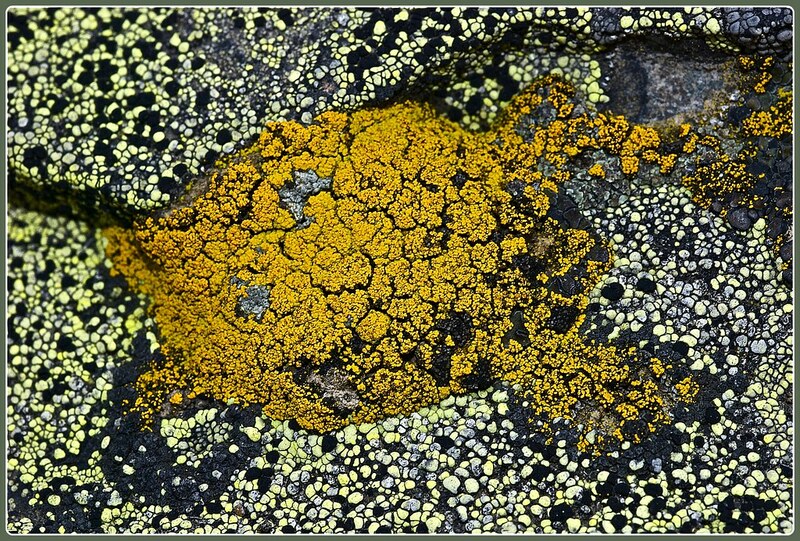 Thanks to great photos like yours, more people are able to enjoy the absolute beauty of lichens. Thanks Rick. That’s a great reason to have a blog!